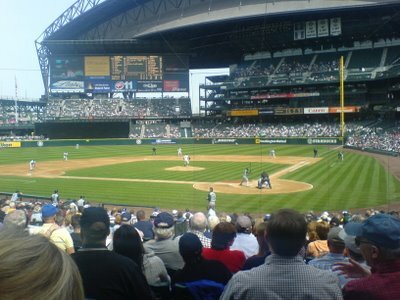 This is pretty much a dedicated post to the trip to I had with Jess today to watch the Seattle Mariners. We left about lunch time and got there a few minutes after the game had hit off. But we hadn't missed anything. And here's a normal pic of... well it look slike the pitcher is concerened with something behind him but the Batter hasnt moved... so I don't know what's going on. As you can see they were pretty damn good seats. Those guys on the right there are the Tampa Bay Devil Rays in their bull pen. So we could hurl abuse at them... but it's not that sort of crowd. We pretty much got food as soon as we got in the ground. I got a burger and Jess got garlic fries, which were basically a mountain of chips covered in ground garlic. Tasty. The game itself could have been worse in two ways... it could have stayed 0-0 and gone in to extra innings, or it could have been a Seattle Sonics game (the "basketball" team). Aside from that it was pretty good. It was sunny, a good temperature to sit out in, and a pretty entertaining day out. Without going too far in to the rules of baseball, there's 9 innings and between each theres a few minutes where the next fielding team warm up. In that time they put some entertainment up on the big screen. Like chase the ace and clips of great players. At one point, the announcer told everyone to pick a boat out of three and they raced around a virtual coarse. Even though this sounds really simple, it had everyone cheering. Unbeknowest to me, theres a tradition at every game that at the end of the top of the 7th inning (between fielding a batting swapping), everyone has to stand up and sing "Take me to the ball game". After that you remain standing and have a bit of a dance to some random song. We had "Louis Louis". I didn't sing or dance. But it was straight up weird. Even funnier was the guys who come out to sweep the sand/dirt who broke in to a song and dance! Oddly enough, only seconds before they started, Jess was trying her hardest to explain to me about these dancing groundskeepers that she had never actually seen. Well here they are in full swing accompanied by "Greased Lightening" for your pleasue. The game itself ended 1-0 to the Tampa Bay Devil Rays. We had beaten them 6-3 and 8-1 in the past two days... Don't know why they choked today. The one run they scored was scored from a balk, so they didnt even have to hit the ball. Great disappointment. At the end of the game, we made a dash for the car and made a quick escape, avoiding the rush. Overall, a very nice day out. I can see why Americans enjoy going there so much. Oh and by the way, a guy down our row ordered a beer and people actually do pass the beer and money up and down for them. It's not just in movies. And there is that annoying organ tune. Right, I might post again later if I see fit!